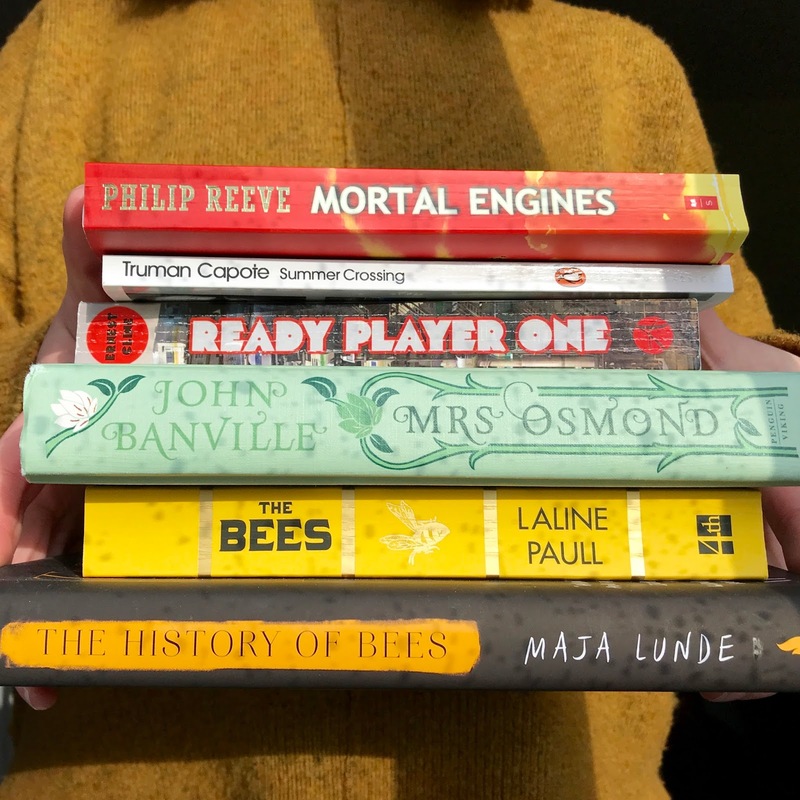 So apparently March began and all I could think about was *Spring* so I read two books about bees back to back. Welcome back to another monthly book round up. I've actually gone for all fairly recent novels this month, which is a little unlike me as I've been reading a little more diversely recently. Nonetheless, it's been a very successful reading month, as I've ultimately enjoyed every book I've read. I think my heart truly lies with post-2000 literature if I'm entirely honest - although I'd say I'm more generally open to anything post-1800; it's the stuff I usually end up liking the most, but I still think it's important to read older texts too, as literature of the past always has a tendency to inspire and relate to contemporary texts. The first text I read this month was entirely inspired by an older novel - one that is actually a true favourite of mine. So here are my thoughts on the books I've been reading. Henry James is one of my all-time favourite authors, and The Portrait of a Lady one of my favourite books, therefore when I saw a review of Banville's 2017 text, Mrs Osmond, essentially a sequel to James' original, I couldn't resist. The novel honestly transported me back in time to James' world and I think Banville really did the original text and its author justice, which was something I was naturally concerned about. Banville truly adopts James' writing style - one not particular easy to get your head around - and gives us an interpretation of how Isabel Archer's life may have continued after the ending of The Portrait of a Lady. Isabel is one of my favourite characters in literature - alongside Edith Wharton's Lily Bart, to name another - and I loved that Banville really captured her character in his text, as she definitely remained the Isabel that James wrote despite the difference in author. I was entirely convinced by this text - Henry James himself could have written it. If you loved the story of Isabel Archer the first time, you'll be truly enamoured with this continuation. I LOVE this book. This is, without a doubt, my favourite book that I've read so far this year. I loved the way the narrative was split between three different times, people and places - it was a very powerful way to tell the story and bring through the message of the novel. I think it helped make it seem entirely real as well, looking at two things that have happened in comparison with something that ultimately will happen, one way or another. The novel was originally written in Norwegian and therefore I read a translated version, which is something that always interests me - I thought the whole text read really beautifully so, naturally, it would have only sounded better prior to translation. There was something very poetic and poignant and yet political about the whole thing, which I really admire. Ultimately the three protagonists are linked together by the fate of the bees, a species that inevitably becomes extinct in the novel. Lunde is evoking in us a feeling that something must change right now, whilst still offering us hope that something lost can also return to us if we can't make the changes necessary to keep bees alive. It's a brilliant novel about a very current issue, and one that our leaders, as the one in the text does, must read into and understand, so that we don't continuously make the same mistakes. An important book about a topic close to my own heart. Another amazing bee book. This one, although featuring the same wonderful insects, was set inside the hive, delving into the inner workings of the hive and its totalitarian regime. Personally, I don't know much about how bee hives work, so I certainly couldn't tell you how accurate this depiction is, but it made sense to me and seemed like a believable representation. I didn't love the fact that there was this one, single character who broke free from the distinct categories of bees, going from a sanitation worker, to a nurse, to a care-giver, to a forager - it obviously seemed a bit far fetched when every single other bee had to remain in the category, or class, rather, that they were born into. Nonetheless, there was always an underlying understanding that when the queen of the hive did, ultimately, die, Flora would have something to do with the continuation of the hive. I think this was nice, because being born into the lowest class of worker, you'd expect her to amount to nothing, so there was definitely the theme of pursuit, or class pursuit, throughout the novel, but written in a way that it seemed like she was just being nice to everyone and working her way up. Overall, I did really enjoy reading the book. It's a kind of dystopia, which tends to be my favourite genre to read, and it's one I'd certainly recommend. At work we've recently decided to start a book club, and Ernest Cline's Ready Player One was this month's book, which we'll soon be discussing, so it's actually handy that I can collect my thoughts on the text here first. It was actually a really enjoyable book to read, with the plot fiercely rallying on regardless of the slow progress the characters often seemed to be making. I think that if you knew a lot about the culture of the 80s you'd probably enjoy the book even more than I did, because for me it was more like a brief insight, which offered only a small contribution to the actual plot. The 80s trivia was just the basis for the characters to solve the puzzle, so it's definitely not essential to know much yourself, or to pick it up whilst reading, as it won't help you personally come to any revelations unless you're a devout 80s know-it-all, like the characters themselves. The ending was a bore for me. It was entirely expected and ultimately you knew the whole way through how it was going to end, which is not something that impresses me in a novel, but that's very much personal preference. It's a good read and I enjoyed the overall reading experience, but I must say, I don't think the film will be for me. I think it's certainly a book that contains more than a film could offer, so if you're planning on watching the film, wait until after to read the book (because it'll be better). I've read a couple of Capote's novels prior to this one, so I knew that I was going to enjoy reading his prose again. This is actually deemed to be Capote's first ever novel, which was only discovered in the past twenty years, which I found intriguing. It definitely has a Breakfast at Tiffany's feel to it, so perhaps in writing this text, he found his inspiration for the famous novella. This one, like Breakfast at Tiffany's, is also short in length, and focusing primarily on a somewhat rebellious young female. I think, like Holly, you're bound to find yourself loving and hating Grady throughout the text. She seems an interesting, accepting character, and yet still comes from an overly privileged background, which paints the picture that she's acting out because she can afford to and doesn't care who else's lives she endangers in the end. If you like Capote, then you'll like reading this one. My final novel of the month wasn't one I loved, but I would still say I enjoyed reading it. One of my friends is currently reading this book and told me it's being made into a film this year, so I thought I'd give it a go. I think, within its genre, which would presumably be teen fantasy fiction, it's rather good, but as an adult reader who tends to like things that are more on the complex side, it wasn't a favourite of mine. It's got a good plot, but it was very predictable - perhaps not to everyone, but as someone who has read a lot of books with the same themes, you know what's going to happen. To be fair, I think the film will work really well and I'll probably enjoy it more than the book. I imagine the whole production will be really strong and just great to look at, whereas with the book I struggled to see the cities in front of me, as they are obviously quite a big, unusual concept, so an actual visual representation would work better for me. If you're on the younger side, or you've not read an absolute ton on books, I'm sure you'll enjoy it more than me, but if you are an extremely avid reader, maybe save this one for the cinema once the film is released. What have you been reading throughout March?